Behind a statue of Charles II is a bronze plaque set in the pavement that says that Trafalgar Square is the centre of London. And indeed this world famous square has been a focal point of the city ever since it was built in the mid 19th century. At the centre of the square is its most obvious, and most famous, landmark - the 50m high Nelson's column that commemorates the death of the naval hero Viscount Horatio Nelson. At the base are depictions of some of his most famous Battles, including the Battle of Calvi (1794) where he lost an eye, the Battle of Santa Cruz (1797) where he lost an arm, and the Battle of Trafalgar (1805) where he lost his life. 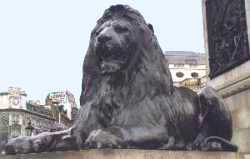 The four lions at the foot of the column were added in 1868 and the fountains as recently as 1939. 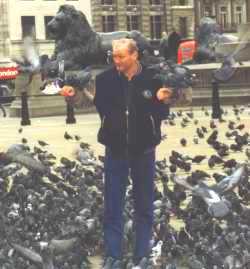 As well as Nelson's column, Trafalgar Square is also famous for its vast number of resident pigeons. If you wish to feed them you can easily purchase birdseed, but be warned - the vast numbers that will try to feed from your hand will probably swamp you! Although these are most obvious attractions, Trafalgar Square is also the location of several landmark buildings. On the north side of the square you will find the National Gallery and the National Portrait Gallery, and to the north-east is St Martin's in the Fields church. And if you look to the south-west of the square you will see Admiralty Arch with the Mall (the street that leads to Buckingham Palace) stretching away into the distance. Meanwhile, on the west hand side of the square is Canada House whilst on the east hand side is South Africa House. Tourists visit Trafalgar Square throughout the year, but it is worth noting that each December the Square becomes the focal point of the Britain's Christmas and New Year celebrations. Since the end of the Second World War, Norway has donated a huge Christmas tree each year as a token of thanks for Britain's part in Norway's liberation from the Nazis, and it is in Trafalgar Square that this tree is displayed. And each New Year's Eve hundreds of people gather in the square to celebrate with drinking and dancing taking place in the open air. Although in recent years steps have been taken to tone down the excessive nature of the celebrations, this is still the place to go if you are in the UK at the new year and you want to go to a party!